Evidence of many different groups of people has been found in Arches National Park. The Paleo-Indians lived as early as 10,000 BC to 7,000 BC on and around canyons of Arches National Park. By circa 7,000 BC the climate was too warm and dry for many large animals so the Paleo-Indians were forced to adapt a life style call Archaic. This meant that they had to live in small groups and travel extensively. Rock art panels have been found along the canyon walls of the Park. Those paintings are proof of early hunter-gathers in Arches. By 1 AD, Archaic culture gave way to prehistoric agriculturists called Ancestral Puebloans; previously know as the Anasazi and Fremont. The Anasazi and Fremont were both agricultural societies whose economies centered upon wild plants, animals, and pottery. By circa 1200 AD, the Anasazi and Fremont left the area of the Park because of poor farming capabilities. In time, the Ute and Paiute Indians also came to inhabit the land. As far as European settlers and explorers, no one really knows who was the first to set foot in the Arches Park area. Denis Julien, a lone explorer, was probably on of the first European to see Arches. He left his name and the date, June 09, 1844, inscribed on a rock fin in the park. In 1888 the first family of settlers chose to settle in Arches. John Wesley Wolfe and his son Fred moved from Ohio. In the early 1920’s Alexander Ringhoffer, a land prospector, traveled through much of the region of the Arches. He was very impressed by the sites and landscape and thought that is should be seen by others. He suggested that representatives of the Denver and Rio Grande Western Railroad visit the area. Frank Wadleigh, the D&RGW's passenger traffic manager, was so impressed that they contacted Stephen T. Mather, the first director of the National Park Service. Mather was intrigued by the area and pushed for the creation of a national monument. Finally in 1929, President Herbert C. Hoover set aside Arches as a National Monument. Through the years the monument's size was modified by succeeding presidents: enlarged by Franklin Roosevelt, diminished a bit by Dwight Eisenhower, then doubled by Lyndon Johnson. At last, President Richard Nixon signed into law in 1971, an act establishing Arches as a national park. Arches is located in a "high desert," with elevations ranging from 4,085 to 5,653 feet above sea level. The climate is one of very hot summers, cold winters and very little rainfall. Even on a daily basis, temperatures may fluctuate as much as 50 degrees. Water and ice, extreme temperatures and underground salt movement are responsible for the sculptured rock scenery of Arches National Park. 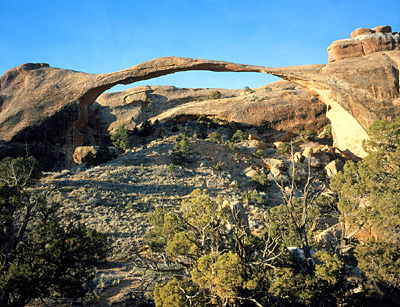 The more than 2,000 cataloged arches range in size from a three-foot opening; the minimum considered an arch, to the longest one, Landscape Arch, which measures 306 feet from base to base. The Park sits on top of an underground which is responsible for the arches and spires, balanced rocks, sandstone fins and eroded monoliths. Also cryptogamic soil is becoming a popular observation of the region. This dark crust covers much of the untrampled desert. Composed of cyanobacteria as well as lichen, algae and fungi, this covering protects against erosion, absorbs moisture provided nitrogen and other nutrients for plant growth.